The Restigouche River Lodge is located on the banks of the world renowned Restigouche River in Mann’s Mountain, New Brunswick, Canada. The lodge owns rights to 3.5 miles of private and exclusive water and sits in the center of this spectacular water shed. Our water line starts from the junction of the Matapedia River in Quebec across to New Brunswick and then to a point over 3 miles upriver encompassing the shores of both New Brunswick and Quebec. The angler will have the experience of fly fishing crystal clear water for large Atlantic salmon fresh from the salt. From spring into June and then again in late summer through the end of September the RRL has an additional 2 miles of adjacent water that is available to our guests. Our pools are very large featuring long runs, experience some of the most beautiful spey water in eastern Canada. Wadding is quite easy with fine gravel and few snags, anglers can also fish from 26 foot motor powered canoes. One advantage that guests of the Restigouche River Lodge have is fishing over Atlantic salmon on some of the Restigouche’s first holding water. Bright chrome salmon with sea lice seeing their first fly and eager to take. These fresh salmon are strong, full of fight with spectacular leaps and line ripping runs. The lodge features holding, high and low water pools with historic names starting from our upriver line, England. Scowshed, Upper and Lower Home, Mann’s, Poker, Ledges and Adams. Come fish the land of the giants and enjoy the relaxation of never leaving the camp to drive for your fishing, it’s all here! The Restigouche River is known for its exclusivity, gin clear water and her large Atlantic salmon. Fish over forty pounds are landed somewhere on the Restigouche every year salmon in the high twenties and through the thirties considered common. Early spring through the end of June is the best time for these magnificent Atlantics. 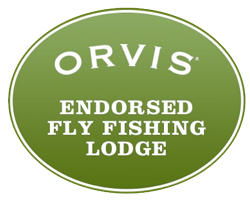 From the spring run of hens into the prime weeks of June and July then on to dry fly fishing culminating with numbers and colorful fall fishing all parts of the season have something special to offer. 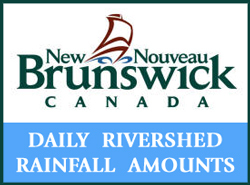 The Restigouche River system is a prime spawning and rearing ground for Atlantic salmon which flows in a northeasterly direction from its source in the Appalachian Mountainsof northwestern New Brunswick to Chaleur Bay. Its meander length is approximately 200 kilometers. The Restigouche is fed by several tributaries flowing south from Quebec’s Notre Dame Mountains on the western edge of the Gaspé Peninsula’ (Kedgwick River, Gounamitz River, Patapédia River and Matapédia River) as well as the Upsalquitch River flowing north from New Brunswick’s Chaleur Uplands. Between 15,000 and 25,000 salmon enter the Restigouche each year, which attracts anglers from all over the world. While many Atlantic salmon are reluctant to strike, the Restigouche variety are aggressive, and once hooked, they fight like devils and are highly acrobatic. “JDZ” writing in Field & Stream magazine says, “They’ve got so many record salmon in the Restigouche that I place no reliance in any estimated weights or lengths myself.” Nonetheless, one fish estimated at about 72 pounds and 58 inches long was caught and released on the Restigouche a few years ago, while a 60 pounder was caught on the Restigouche last season, according to Outdoor Canada magazine. 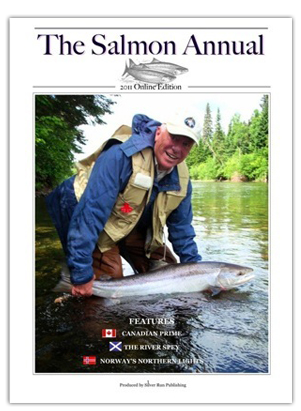 Knowledgeable anglers rank the Restigouche with or above such famed rivers as the Alta, the Gaula, the Spey, the Dee, the Big Laxa, the Ponoi, the Kharlovka, the Selá,. the Grand Cascapedia, the Miramichi, the Eagle, and the Moisie. For over 100 years, the Restigouche has attracted many of the world’s leading sportsmen. Among the VIPs who have fished the Restigouche are the Duke of Windsor, George H.W. Bush, Norman Schwarzkopf, Hubert Humphrey, Ted Williams, Bing Crosby, William K. Vanderbilt, Lord Beaverbrook, Maurice Richard, and Brian Mulroney. Join us this year … for your adventure of a lifetime at the Restigouche River Lodge.